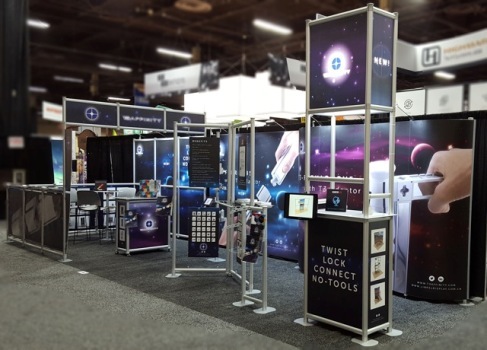 Trade resellers wanted for the new T3 Affinity exhibition and display graphics system. UK based Tecna Display Limited is looking for trade customers who would like an opportunity to become authorised resellers of its new T3 Affinity display system. With manufacturing facilities in North London, the company is well known for its T3 “twist-lock” cube connector and aluminium extrusions which allow users to build re-usable and re-configurable display graphics for hundreds of applications. Walling; Retail displays; Interactive retail points; Pop-up Shops; Perimeter Signage; Information points; Walk-in booths; Shell schemes; Room dividers; Shelving systems and more. The Affinity system comes with a range of shelving and garment display options, features which make it very suitable for retail environments. T3 Affinity also has a 90 degree connector so right-angled structures including plinths, towers, stands and stand-alone units can be built rather than just flat walls. Managing director Jonathan Evitt explains the theory behind the new Affinity system, “When I developed the original idea for T3, and the ‘twist, lock’ connector, we always intended it to be a medium from which trade printers could hang and display wide format graphics.